Perhaps some of my long time readers will remember my outing of Grania O'Malley, a delusional 65-year-old woman, who has been trying to convince courts, lawyers and others that she is Lady Grania Mountbatten, the only daughter of Lady Iris Mountbatten and her first husband, Hamilton O'Malley-Keyes. The woman is mentally ill, yet she is able to waste British tax payers money with court case after court case, trying to claim money from Lady Iris's marriage settlement from her first marriage. Memo to Grania: there is no money. Lady Iris died in near poverty. Lady Iris blotted her copybook with her first marriage to Hamilton, a Roman Catholic, who was an abusive husband. The couple separate not long after the marriage, and Lady Iris had an affair with a black musician -- scandalous in the 1940s. Her behavior led to an estrangement with her family. She was not even permitted to attend her paternal grandmother's funeral. She and Hamilton were divorced in the summer of 1946. Lady Iris traveled to the United States, was not successful in finding work, had money issues, and moved to Canada, where she lived for the rest of her life. She married two more times. In 1957, she married an American jazz musician, Michael Neely Bryan. The marriage lasted only a few months. Bryan is the father of her only child, her son, Robin Alexander Bryan. In 1963, she married a Canadian, William Alexander Kemp. This marriage, too, failed. The couple separated but they never divorced. In January 1947, Hamilton married for a second time. His second wife, Eleanor de Pentheny O'Kelly, known as Sadie, gave birth to five children, four sons and one daughter, Grania Mary, who was born in France on July 31, 1950. At some point, Grania, who has at least three sons by three men (no husbands), snapped, and she chose to morph into someone who did not exist. This has been going on for more than 20 years. Robin Bryan is understandably distraught by the lunacy of Grania O'Malley. How can she not be charged with fraud. 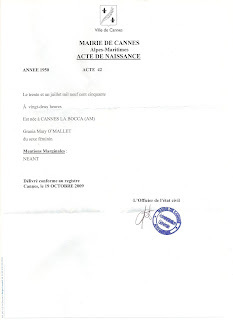 She has been able to obtain a British passport and other documents with this fake name and incorrect date of birth. She has made herself four years older, by claiming she was born on July 31, 1946. 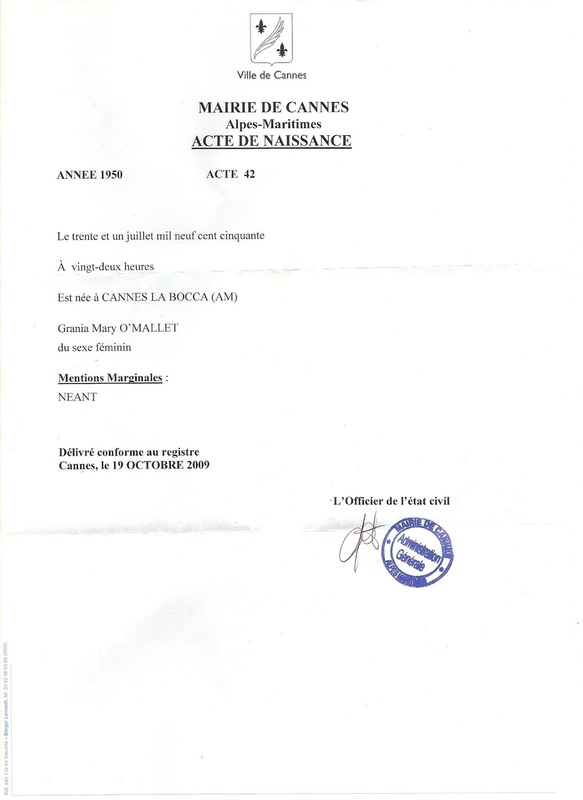 Grania cannot produce a legitimate birth certificate that states she was born in 1946 with Lady Iris and Hamilton as her parents. The birth certificate for Grania Mary O'Malley is available. I have a copy of the official registration. 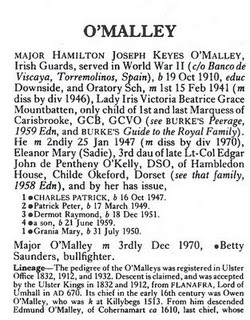 Siblings, a nephew, cousins, a lawyer and others have all stated that she is Grania Mary O'Malley. I know she has received public assistance, but, by altering her birth year to 1946, has she connived to collect senior benefits in the United Kingdom for four years before she was legally entitled to these benefits. This is something that local officials should investigate. Until earlier today, I had not heard a peep out Grania O'Malley. Someone told me that Wikipedia had removed her entry due to the proof that she is not the daughter of Lady Iris. I received the following in my Other message file on Facebook. I can only assume that she thinks I was behind her discomfiture. This would be an incorrect assumption as I have an aversion to Wikipedia. "still on my case marlene, you really are obsessed. get help. you are very sick women. i do not know what you want from me. any person obsessed over me as much as you is sick and should locked up in prison or an institution, - brought to justice. you do not have a right to disturb and hurt people. their lives do not belong to you and no one owes you a living, you owe it to yourself. do not disturb me or my children again, do you understand. accordingly to my research, you worked part time as a nurse for my mother iris, you stole money and photos and other belongings from her, abused her verbally and physically. i would not be surprised if you had enhanced or conspired in her death. she was only 62. I can find you and bring you to justice. cyberbullying may not be illegal, but it can be considered a criminal offence under legislation such as the Protection from Harassment Act and the Criminal Justice and Public Order Act." Reading her twisted words, I am reminded of the song, "She's a Nut" from the Broadway musical, On the Twentieth Century. I realized a long time ago that Grania O'Malley is not very good at research. I have real cause for a libel suit against this woman by virtue of her claims that I worked part time as a nurse for her mother, that I stole money, verbally abused her, and may have conspired to kill her. Grania: please present your evidence that in 1982 I was a part time nurse in Toronto, Canada, and that I stole from Lady Iris and was responsible for her death. I visited Lady Iris twice in the early 1980s (and have the photos to prove it.) I can also prove that I have never worked in Canada, and I have never been a nurse. (I may need to nurse a few drinks after completing this article). I have proved who you are and who you are not. By the way, Grania, Lady Mountbatten was made aware of your duplicitous statements. He married a bullfighter!! I didn't women did those things back then. Shes living in some old folks accomodation in Wales now. My grandmother has seen her walking her dogs in the village. Shes known as "Doolalley O'Malley" in her place and is still, surprise surprise, trying to pas herself off as aristocracy. Talk about the gift that keps on giving.